Big Drums From One of Today's Top Prog Rock Drummers! 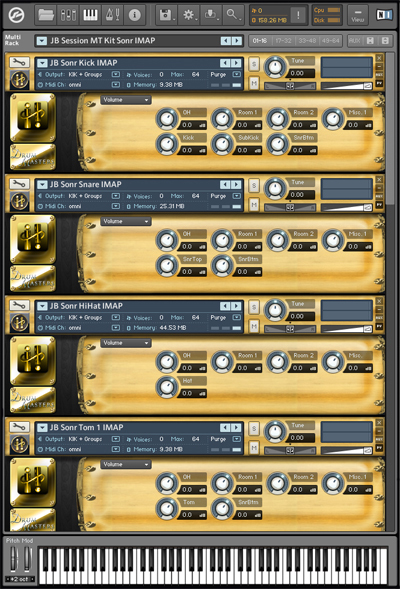 The NDV Grtsch Multitrack Drum Kit is part of the Drum Masters series where you can pick out a la carte kits and grooves that work with Sonic Reality’s Infinite Player plugin and build one of the most powerful virtual drum collections ever! This product is a multi-sampled Gretsch® "Phil Collins-style" drum kit made to be played from Sonic Reality’s Infinite Player. It was recorded in Pasadena, California at "Mower Studios" with progressive rock drummer Nick D Virgilio. It is a 7 piece kit recorded in a brick walled live room modeled after the now defunct Townhouse studio in London where Peter Gabriel's ground breaking third album and Phil Collins "Face Value" was recorded. The sound of this kit is very much in the style of early 80's Phil Collins and Genesis. Ross Garfield, the Drum Doctor, provided the set for Nick with tweaking and tuning to reproduce this particular character drum sound. This kit was recorded with snares on. The snare of this set has a cutting "ping" to it that is similar to the snare sound of Bill Bruford and Stewart Copeland. This NDV Gretsch® kit is very crisp, punchy and diverse. You can get everything from a tight ghosting dry sound to a massive big tom fill room sound all in one! 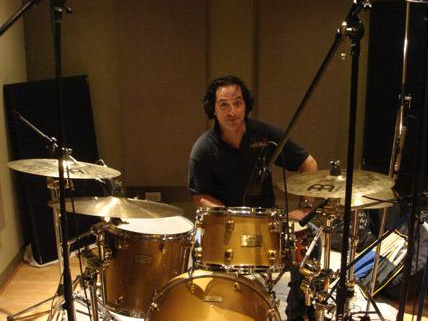 Nick D Virgilio is one of today's top modern rock / progressive rock drummers. He has worked with Genesis, Spock's Beard, Tears For Fears, Kevin Gilbert, Jordan Rudess, Mike Keneally, as well as numerous other side and solo projects. Nick delivers everything from solid pop grooves to quirky odd time signature progressive rock rhythms and is one of the only drummers to have a fluid effortless feel on par with that of one of the most distinct sounding drummers in rock history, Phil Collins. Quote from Dave Kerzner of Sonic Reality about Nick D Virgilio: "I used to play with Nick in Kevin Gilbert's band. He is certainly one of the best drummers I ve ever played with and I ve always been blown away by his talents as a musician. He has been a tremendous help to Sonic Reality in many areas from assistance in the presentation of Ocean Way Drums and more. Like Nick I too am a fan of Genesis and Tears for Fears as well as the late Kevin Gilbert who we both had the fortune to collaborate with. So, for his ProFile we set out to do various sessions at Kevin's old studio to capture various classic BIG drum sounds we both liked. Even though Nick is a Mapex endorsed drummer, I suggested that we also sample a classic Premier® and Gretsch® kit to emulate a progressive rock and Genesis style sound. During those sessions at Mower we also sampled additional snares including the Tama® snare that was used on Nirvana's Nevermind album as well as a vintage 40's Leedy kit all of which are coming out separately for the Infinite Player as well. Those kit pieces and extra snares plus the NDV Premier and Gretsch kits provide some nice kit pieces for swapping when you re making custom kits since they share similar elements like the sound of that big room. While we didn t record many grooves for the Gretsch and Leedy kits, we DID record multi-track grooves from around 40 different Genesis songs plus grooves from Tears for Fears, Spock's Beard and Kevin Gilbert. Those multi-track grooves may eventually be released for the Infinite Player at some point as well." 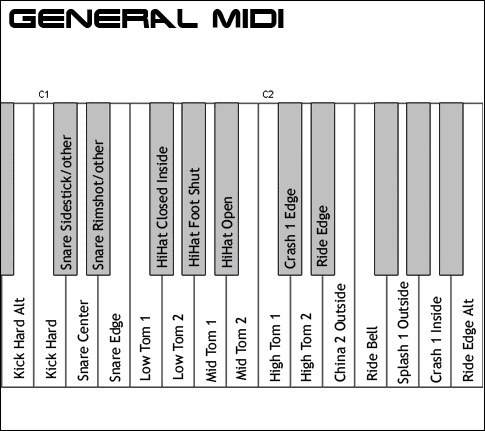 Gretsch Kick Drum: 20" x 14"
Dunnett Cast Iron Snare Drum: 14" x 4"
Gretsch 3 Rack Toms: 10" x 6.5"; 12" x 8"; 15" x 12"
Gretsch 2 Floor Toms: 16" x 16"; 18" x 16"
Sabian 2 Crash Cymbals 16" 18"
Kit Info: This kit is in the style of Phil Collins famous "barking toms" drum kit. Played by Collins successor on the drums in Genesis, Nick D Virgilio, the Gretsch 7-piece drum kit combines the wide tonal range of the array of drum sizes with the attack and short decay of single-headed toms, creating the ideal Phil Collins style kit. 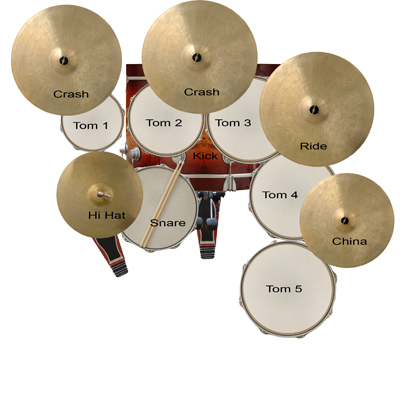 Drum Masters 2: British Rock Multitrack Grooves.